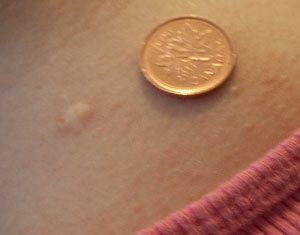 A scar from a mole I’d had removed from the back of my neck. The penny is there for a sense of scale. I’m not big on doing public service announcements, but in light of my most recent doctor’s appointment, it’s time. It’s summer time in the northern hemisphere. That means that we’re seeing print ads and commercials for summer skin protection. That summer skin protection may be in the form of sun blocks or SPF clothing, but it’s all out there. Unfortunately, there are people out there who don’t think much about skin protection, even when the sun’s harsh UV rays are beating down upon them on a regular basis. These people may be parents who are passing along the same message to their children. I was one of those children at one point. Because I never got a sun burn (only a deep, dark tan that Snookie would be jealous of… without the orange), my parents never worried about me wearing sun block. Even though I played outside all day long under the hot Florida sun, they remained unconcerned. My father and my brother-in-law both worked outside in the sun; they never gave much thought to their own skin protection. Now that lack of attention to sunscreen is catching up with me.